Halloween – it’s the most wonderful time of the year! We love decorating, and dressing up, and the most fun of all – Halloween parties! With a million ideas out there, it’s hard to find original ideas that are sure to wow your guests. 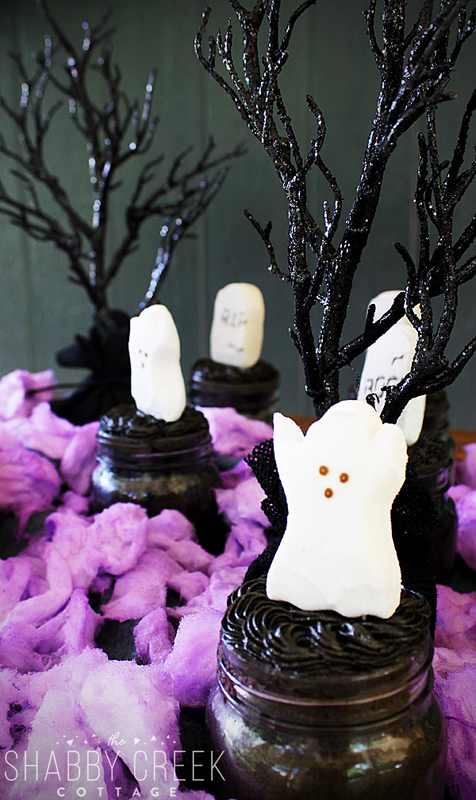 With a few basic ingredients and supplies, you can make this fun and spooky display that’s sure to wow your guests. First you’re going to start by baking cupcakes in a jar. You can either use a white box cake mix or a homemade recipe. Just add some black food coloring to make the batter Halloween inspired. I baked mine in a small jar, because if you do it on regular cupcakes, they won’t hold up to all of the display around them. Be sure to fill the jars just over half full, because the cake will rise quite a bit. If they do spill over the top, use a knife to cut them off even with the top of the jar. 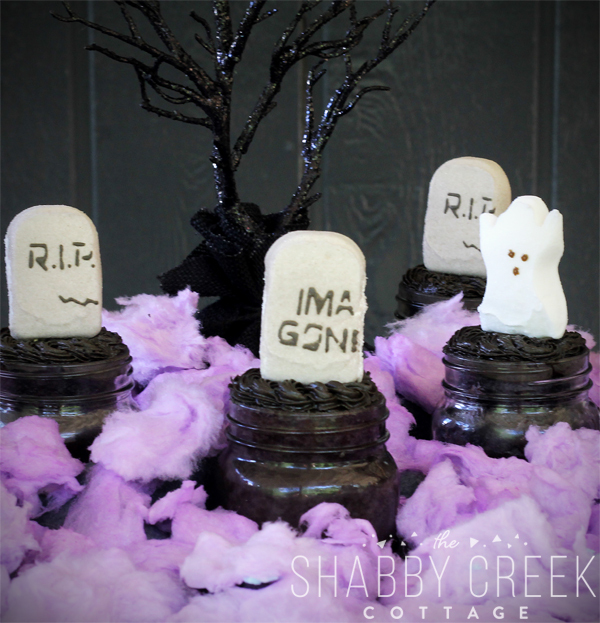 After you have iced the cupcakes, add some tombstone or ghosts Peeps on top by putting two toothpicks in the bottom (trust me – one isn’t enough to hold it up). Then we took a piece of felt and bunched it up in spots, securing the folds from the bottom with safety pins. Next we added a couple of trees from Target’s Dollar Spot (but you can find them in almost any Halloween decorating section). 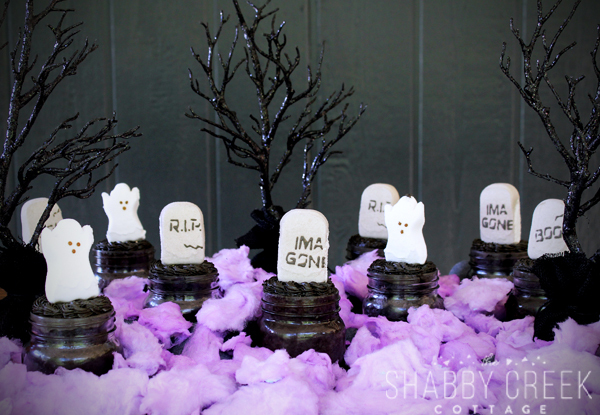 Lastly, we added purple cotton candy all around to look like spooky fog. We used 10 cupcakes, but if you did it down the length of the middle of a table, it would make an awesome Halloween display, too! 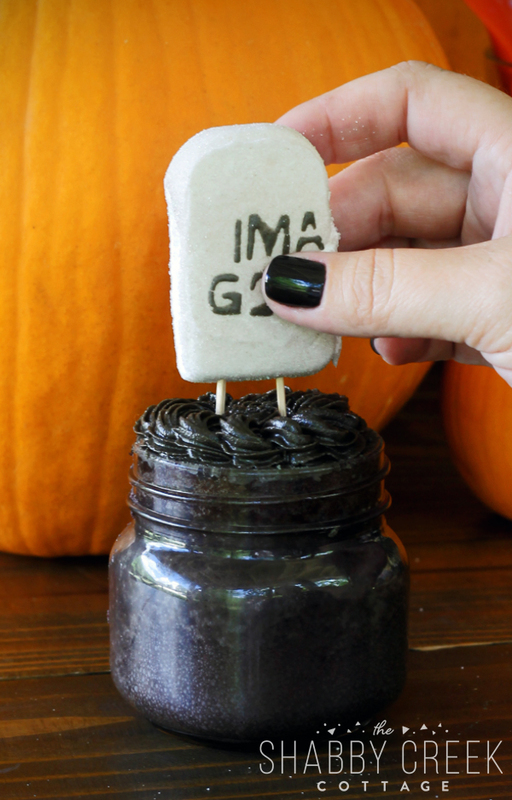 Want more ideas for Halloween in Jars? Be sure to visit my friend so see their awesome ideas, too! Oh my gosh how fun is this? So clever! It’s best to start with a chocolate cake mix/recipe and add black food coloring. You will get black cake much faster this way.